[UPDATE: Tuesday, September 25, 5:30 a.m. EST] After announcing when his official Jordan Brand collab would be unveiled, DJ Khaled has now revealed the extent of the upcoming project. 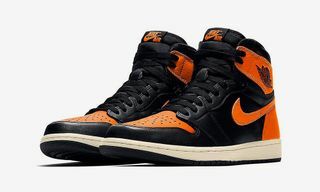 In addition, the producer has shared information on how his followers can enter for a chance to win a pair of his sneakers. The article below has been updated to reflect this new information. 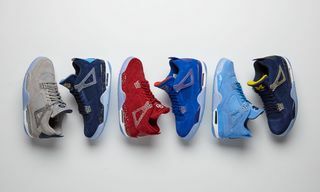 Key Features: Both colorways are primarily blue with Jordan Brand’s iconic elephant print pattern on the heel and toe guard. One pair, dubbed the “Another One” Air Jordan III, features a blue leather upper, white sock liner, black leather detailing, and a blue outsole. 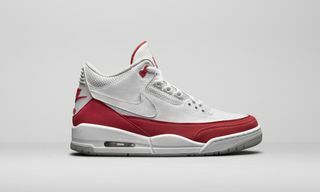 The second pair is called the “Father of Asahd” Air Jordan III and features buttery blue suede on the upper, red detailing on the eyelets and back of the tongue, and an icy translucent outsole. 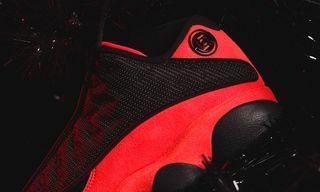 Both pairs also feature the Jumpman on the right heel and “WE THE BEST” branding on the left heel. Editor’s Notes: DJ Khaled officially unveiled his upcoming collaboration with Jordan Brand via Instagram. After sharing a short clip on his feed that outlined the location and date of the collection’s unveiling, Khaled followed up the original post with a detailed look at the two colorways. 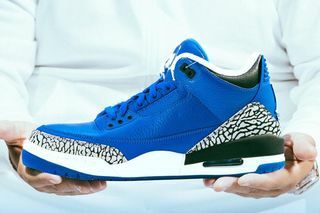 Dubbed “Father of Asahd” and “Another One,” both colorways are primarily blue with Jordan Brand’s iconic elephant print pattern on the heel and toe guard. Differences include a leather upper on the “Another One” and suede on the “Father of Asahd,” while both pairs also feature “WE THE BEST” branding on the left heel. Scroll through the official images shared by Khaled himself below. 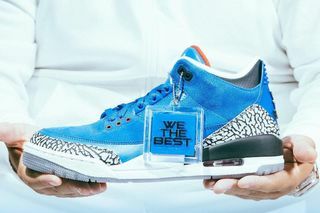 In addition, the producer shared a link to where his followers can sign up for a chance to win a pair of his “We The Best” Nike Air Jordan 3s for the next 24 hours. The DJ Khaled x Nike Air Jordan sneaker was initially unveiled at an event in Los Angeles on September 24. 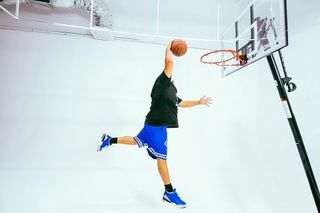 Fans in attendance had the chance to win a pair by buying a We The Best x Jordan T-shirt, which was bundled with the upcoming Father of Asahd album. For those not in LA, Khaled announced the launch of webstore wethebeststore.com, from which fans can purchase the same bundle with the same chance to win the sneakers. It is also possible to enter a giveaway for the sneakers here. Khaled and Jordan Brand have worked together in the past, most famously on the Nike Air Jordan III “Grateful,” which ultimately never made it to retail stores.